Gymnastics is not just for kids! 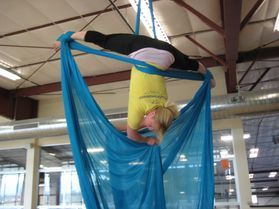 Children and adults alike can join the fun of gymnastics. In our adult gymnastics program you will learn basic gymnastics moves. Increase strength and flexibility, coordination, air and body awareness, agility, speed and most of all- it’s fun. Beginners up to the experienced gymnast, everyone is welcome, no experience required! Our CPR /first aid, USAG safety certified professional gymnastics coaches are going to give you a “fliptastic” work out! Who said tricks are for kids? This open format class is held in our main gym. Spring Schedule: Tuesday, Wednesday and Friday nights. 8:15pm -10:15pm. Please sign up 24 hours in advance. Call 805-547-1496. 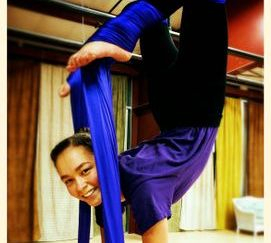 Athletes will practice aerial acrobatic skills while hanging from a special silk fabric in a padded, matted and safe environment. A fun way to build strength and flexibility. *We also have Punch Cards available. **A Membership is required for all Punch Cards. Wear comfortable/athletic clothing with no large pockets, zippers, or buttons; you will be barefoot.